Adding reviews and giveaways to your blog are excellent tools to add readership to your site. If you are looking for ways to get free stuff; this book is for you. The “50 Things to Know About Getting Free Stuff To Review” eBook shares tips and tricks for reviewing products and more importantly, how to get products to review. It is based on author Susan Kinchen’s knowledge from years of blogging and reviewing products! Oma loved that the pages were packed with tips and tricks that can help you understand how to sell yourself to readers and companies. This is an awesome guide for beginners and equally useful as a reminder/checklist for practiced reviewers. 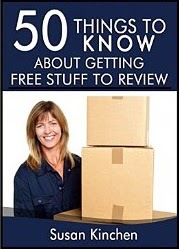 “50 Things to Know About Getting Free Stuff To Review” is a quick and easy read. My favorite tip was #13 of the 50 – “Set Up Separate Email Account.” There are many ways to set up free email accounts with Yahoo, Google, or other email services. It does not take long to set up and can save you a lot of time in the future.